Fiction – Kindle edition; Amazon Encore; 296 pages; 2010. Review copy courtesy of publisher. Having been a newspaper journalist in the past, I am partial to novels that are set in newspaper offices. 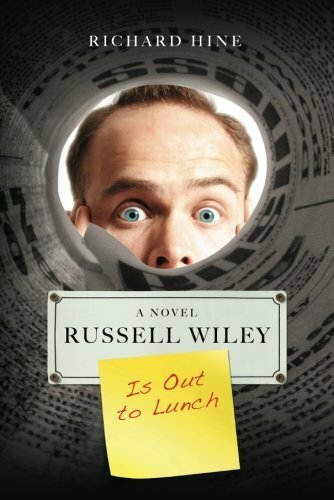 Richard Hine’s Russell Wiley is Out to Lunch certainly fits the bill, but this is a newspaper novel with a twist: instead of focusing on the editorial side, this one looks at the advertising and publishing side. The story is told in the first person by Russell Wiley, the sales development director on the Daily Business Chronicle, a New York-based publication, which was formerly owned by Burke-Hart Publishing, but which has recently been subsumed by the Ghosh — “pronounced ‘gauche’, never ‘gosh'” — Corporation. Russell’s role involves helping the paper’s sales people sell more advertising pages. But it is an uphill battle. The industry is in terminal decline. There’s not enough new readers to replace the ones that are dying off. And the only strategy anyone seems intent on is a short-term one in which cutting costs and letting people go is the only way to ensure growth. We read in our own and other newspapers how Larry Ghosh intends to return Burke-Hart Publishing and its flagship publication, The Daily Business Chronicle, to a new era of profitability. We read in management memos that we are looking to change the DNA of our division. We witness the influx of new managers, consultants and free-floating strategists — people who seem to speak a different language than we are used to and who measure success by different metrics. Despite all the doom and gloom — advertising revenue is down 40 per cent — Russell turns down a job offer with Google six months before their IPO, because he “thought newspapers still had a role to play: helping us make sense of the world at least once every twenty-four hours”. His decision to stay with the Chronicle is aided by a promotion, an upped bonus target and a misguided sense of loyalty. …stuck in the world of middle management. Navigating my way through a world defined by hiring freezes, reductions in force and faux-generous severance packages. Buried under an increasing workload. Getting calls from out-of-work former colleagues still looking for jobs—while the headhunters have all gone quiet. I’ve dug myself into a hole. I assumed my performance would speak for itself. I had faith that management would recognize and reward good work. Then I sat back and watched as other people—aggressive, hard-charging, permanently networking types—charged ahead. I let it happen. Why? Because I was too busy digging my hole to do anything else. I didn’t have time to deal with all the networking. I didn’t realize the subtle difference between being labeled a high performer instead of a high potential. But that’s all got to change. I can’t sit back anymore. We like to promote collegiality. Our performance management system is directional, based on the personal, nonscientific observations of departmental managers. There’s no penalty for poor performance built into our grading system. We don’t have the annual cull of the lame, the weak and the unproductive. When business gets bad and layoffs come, we start to panic. We reduce headcount randomly. We’re just as likely to eliminate star performers or reliable workers as we are to chop away the real dead wood. She’s worked here since 1975 and seems not to have updated her wardrobe or her job skills since then. Because jobs at my level no longer justify full-time assistants, Barbara is supposed to support my entire department. But beyond the fact that she sometimes answers my phone and offers to transfer people into my voicemail, I simply don’t have any work I can give her with confidence. […] Despite all that, Barbara has taught herself the skills she needs to upload digital photographs of her grandchildren and email them to her friends and family around the world. She is also, I am told, an expert at placing last-minute bids in online auctions for a certain kind of collectible porcelain figurine. There are plenty of other characters in this book which will seem uncannily familiar to anyone who has worked in an office or managed staff. Hine has also successfully captured the daily politics and shenanigans that go on (he paints a rather withering, but pitch-perfect, description of a consultant brought in to solve the Chronicle‘s woes that had me tittering over my Kindle). While the plot is relatively simple — will Russell escape imminent disaster and live to see another day (or career)? — this is a fast-paced, hugely enjoyable, read. My only quibble is the horrible cover that makes this book look cheap and nasty. I’d never pick this up if I saw it in a shop.